Are you watching CNN’s coverage of the “grenade like device” that DC police are responding to at 16th and Kennedy Street NW? If so, do you note the many errors in their report? Last but not least, I doubt there is an emergency at all – if DC Alert hasn’t sent at least a dozen texts about it, does it exist? If you want the facts, try Fox News (did I just write that?). 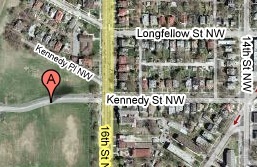 They have the park police reporting a suspicious package in the north playing field of Morrow Drive at Carter Barron. Married, mortgaged, and soon to be a father, Wayan Vota is in the fast lane to mid-life respectability - until the day his brood finds his intimate journal of global traveling and curses him with the ever-eternal reply "I'm gonna be just like you, Dad!"